Madhuri Dixit will be seen dancing with toons Motu Patlu. Bollywood’s dancing diva Madhuri Dixit, who has grooved with stars like Shah Rukh Khan and Salman Khan, was more than happy to get a chance to learn some dance steps from cartoon characters Motu Patlu recently. On an episode of reality show ‘Jhalak Dikhhla Jaa 7’, Madhuri will be seen having fun with Nickelodeon toons Motu Patlu. The much loved toon duo was seen shaking a leg and doing an amusing act for the viewers. 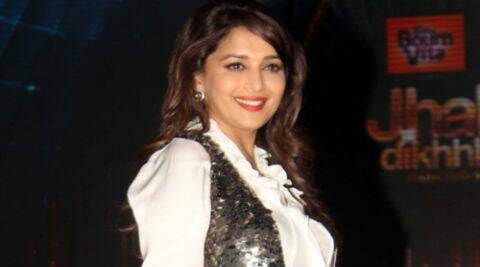 Madhuri, a mother of two, seemed to enjoy it and was also seen taking pictures with them, said a source. “In fact, Motu Patlu were seen teaching some crazy fun moves to the dancing diva herself,” the source added.